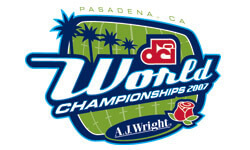 Drum Corps International is proud to announce that the 2007 DCI World Championships will be presented by A.J. Wright. A.J.Wright offers brand name apparel, footwear, home fashions and giftware at prices up to 70 percent off national discount and chain store prices. The company is based in Framingham, Mass. and is a part of The TJX Companies, Inc., the world-wide leader in off-price retail merchandise. As part of the overall championship sponsorship, A.J.Wright also will serve as the on-air sponsor of "Big, Loud & Live" Drum Corps International's live World Championship cinema broadcast. This broadcast will appear in select movie theaters across the country during the 2007 DCI World Championships in Pasadena, Calif.
"We are excited to enter another year in our relationship with A.J.Wright as we head to California for the World Championships this August. I thank A.J.Wright and its employees on behalf of Drum Corps International, its member corps and fans, for their continued support and loyalty to the drum corps activity over the last three years of this successful relationship," said Dan Acheson, Drum Corps International Executive Director and CEO. A.J.Wright is strongly dedicated to youth and community involvement across the country, as seen in the company's dedication to Drum Corps International participants. The company is also a firm supporter of Boys & Girls Clubs of America, providing for the organization through donations at store grand openings and through annual campaigns. At A.J.Wright, we believe that being an integral part of a community means much more than simply providing a service or fulfilling a demand. It's about giving something back to the communities in which we reside. As a community member in your neighborhood, we hold ourselves to high standards of community involvement. Not because it sounds good, but because it is the right thing to do. Or visit A.J.Wright online at www.aj-wright.com.